Crisp Biscuit with Caramel (38.1%), Desiccated Coconut, Hazelnuts and Rice Crisps in Milk Chocolate. 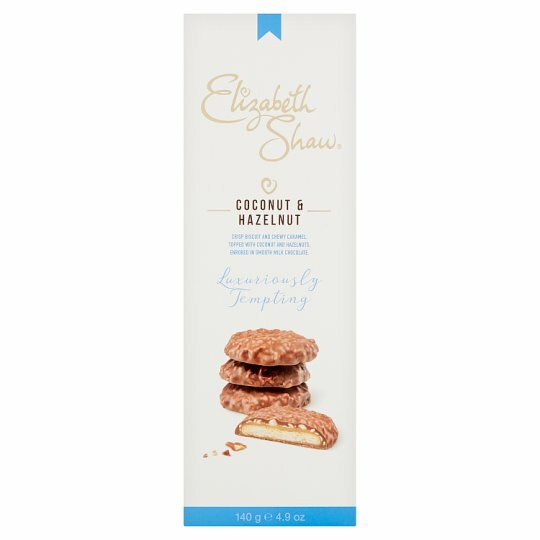 Crisp biscuit and chewy caramel, topped with coconut and hazelnuts, enrobed in smooth milk chocolate. The origins of Elizabeth Shaw and the heritage of making quality chocolate date back to 1881 and our original After Dinner Mint Crisp. Guarantee: At Elizabeth Shaw we have a long-standing reputation for the quality of our products, which we value greatly. Therefore, if this product was damaged in any way when you received it, please return the complete package to us stating where and when you purchased it; we will replace it and refund your postage. This warranty applies within the UK only. It does not affect your statutory rights.